See BlueParrott's latest innovations at the Texas Trucking Show: The award-winning B350-XT (left), with programmable Parrott Button™, and the ground-breaking Xplorer™ (right) with extendable mic boom. [W]e’re excited about this new opportunity to share our latest products with the professional truck driving community. 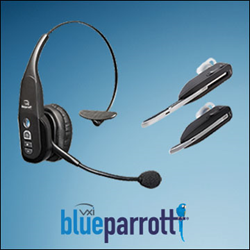 VXi Corporation is spotlighting their BlueParrott® headset line at this year’s Texas Trucking Show at the George R. Brown Convention Center in Houston, Texas, June 25-27, 2015. This will be VXi’s first time at this event, and the company is eager to extend its reputation as the trucker’s #1 Bluetooth choice with two new headsets, the B350-XT and the BlueParrott Xplorer™. VXi BlueParrott has long been the headset of choice for professional truckers, for the industry’s best noise canceling, and clear, natural sound quality. But the real reason is VXi’s commitment to innovation. The two newest BlueParrott headsets, the B350-XT and Xplorer, perfectly illustrate this committment. The VXi BlueParrott B350-XT was recently honored with a CES Innovation Award. It’s home to an array of new technologies, but the B350-XT’s most promising innovation is its programmable Parrott Button™. It can be set on the go (via the BlueParrott Push-to-Talk App) to perform a range of functions, like mute, speed dial and more. The VXi BlueParrott Xplorer, with the extendable microphone boom, is the first small Bluetooth headset to deliver the noise canceling people need. When life gets loud, the boom can be slid out, putting the mic closer to the user’s mouth. With the boom extended, Xplorer knocks out 90% of background noise. VXi will also be signing people up for the BlueParrott Driver’s Club at TTS. Members get BlueParrott gear and may take part in new product field trials. There’s also a quarterly newsletter and exclusive contests. The company will be giving away the new BlueParrott Xplorer headset to attendees who, after joining the Club at VXi’s booth, are spotted wearing their Driver’s Club pin on the show floor. Driver’s Club members will also receive a special TTS promo code after the show, good for a special members-only discount. Learn more about the VXi BlueParrott B350-XT and Xplorer, as well as other VXi smart-tech advances, at the Texas Trucking Show, Booth #731.